There's no doubt about it, rats are hysterically funny. First came the comic book rat, then the real thing. 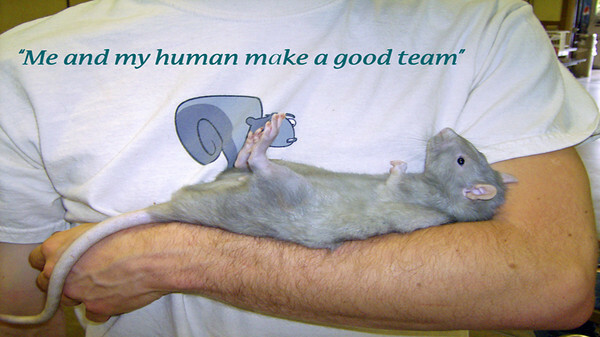 Look for videos and photographs expressing the joyously funny nature of rats. "... because I lay here and he scritches me." Thus says Smokey Rat in the arms of his human, Jared Hart. Relaxed pet rat, Smokey and Jared. at Rodentfest, Leesport, PA, 5/1/2010. This video shows some awesome pet rat trust training. Smokey enjoys lying on his back in the crook of his human's arm. Smokey is so sweet that he enjoys being held by strangers, too.